Firm rubber like resilience you can actually feel. They embody the best features of rubber (the elimination of noise, vibration and harshness) while still retaining the toughness and durability of plastic or metal. Resilience is the secret and the real benefit. 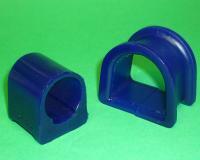 Far superior product in comparison to other polyurethane bushes. Manufactured to the highest standards guaranteeing reliability and ease of fitment.